Hey everyone, I’m sorry for the lack for video tonight. We are on our way to Colorado from Texas for a little R & R (and for my wife to give a speech at a banquet) this week at my wife’s parents house, and today has been a full day of driving. Which means I’m to beat to edit, upload, and post a video tonight. 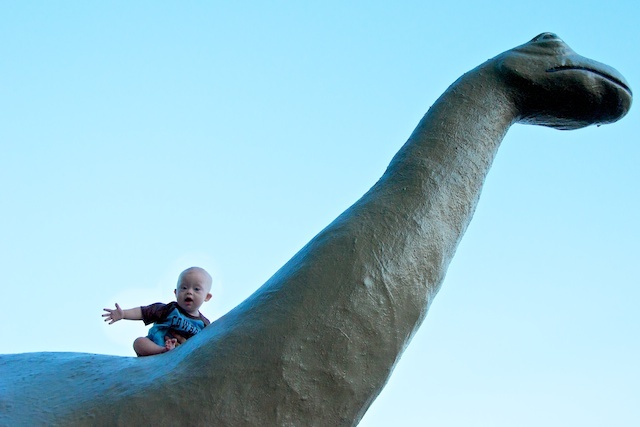 However, I hope this mega-awesome picture of Noah taming a dinosaur we saw in New Mexico more than makes up for it! I have a son with Down syndrome who is 6 years old.